An international team in which a UPM researcher is involved has shown that it is possible to mechanically destroy cancer cells by rotating magnetic nanoparticles attached to them in elongated aggregates. The project work led by Professor Yu Cheng from Tongji University (Shanghai, China) with the participation of Universidad Politécnica de Madrid (UPM) and other institutions from various countries has in vitro shown that it is possible to induce with very high effectiveness the death of cancer cells thanks to the force produced by the motion of magnetic nanoparticles aggregates. This new study, published in the Theranostics journal, combine the advantages of firstly the nanometric size of the particles to reach cancer cells, and secondly, the bigger size of aggregates to produce greater force required to induce the cell death. Because of their singular properties, researchers have been developing a great amount of therapeutic applications using magnetic nanoparticles, especially for drug delivery systems and hyperthermia treatments for tumors. For this last example, the particles increase their temperature when are subjected to a magnetic field that vary to high frequency reaching values that can produce the death of cancer cells. There are other studies that have developed applications to lower the risk of infections on implants and prostheses and promote the growth of tissues. In this context, the team of research, in which Professor Gustavo Plaza from the Centre for Biomedical Technology of UPM is involved, has proposed another research line less explored: the application of forces at nanometric scale with therapeutic purposes. The goal of this study was the production of forces high enough to lead the mechanical destruction of cancer cells. The technique of functionalization allows researchers to modify the surface of nanoparticles by coating them with specific molecules in order to join certain types of cells. In the case of cancer treatment, the nanoparticles are covered with molecules that specifically join proteins that are expressed predominantly in cancer cells and not in healthy cells. This research has used this method to treat cancer cells in vitro. It was proved that cells internalize the functionalized nanoparticles, mainly into lysosomes, which are small cell organelles. 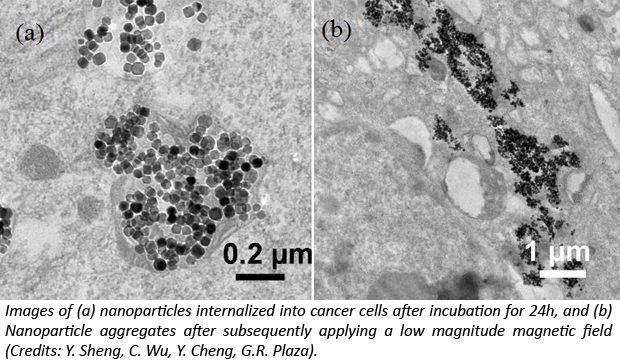 The application of an external relatively low magnetic field results in the formation of elongated nanoparticle aggregates. Finally, under a low frequency rotating magnetic field we achieve the movement of nanoparticle aggregates that produce forces high enough to break the membrane of the lysosomes and the cell membrane, inducing the death of cancer cells with a very high effectiveness. Previous works had used individual nanoparticles or particles of micrometric size (thousand times bigger than nanoparticles) to mechanically damage cancer cells. According to the researcher Gustavo Plaza, this new study combines the good properties of nanometric scale to reach the cancer cells and the greater size of aggregates to produce higher forces. The UPM contribution to this work has been related to the estimation of magnetic fields and the forces exerted on the nanoparticle aggregates as well as the design of the experiments. Y. Sheng et al. 2017. “Elongated Nanoparticle Aggregates in Cancer Cells for Mechanical Destruction with Low Frequency Rotating Magnetic Field”. Theranostics 7:1735-1748.